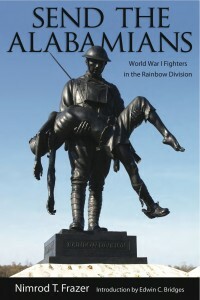 Send the Alabamians recounts the story of the 167th Infantry Regiment of the WWI Rainbow Division from their recruitment to their valiant service on the bloody fields of eastern France in the climactic final months of World War I.
time of peace, for Lord’s sake, send them to somebody else! The ferocity of the Alabamians, so apt to get them in trouble at home, proved invaluable in the field. At the climactic Battle of Croix Rouge, the hot-blooded 167th exhibited unflinching valor and, in the face of machine guns, artillery shells, and poison gas, sustained casualty rates over 50 percent to dislodge and repel the deeply entrenched and heavily armed enemy. Relying on extensive primary sources such as journals, letters, and military reports, Frazer draws a vivid picture of the individual soldiers who served in this division, so often overlooked but critical to the war’s success. After Gettysburg, the Battle of Croix Rouge is the most significant military engagement to involve Alabama soldiers in the state’s history. Families and genealogists will value the full roster of the 167th that accompanies the text. Richly researched yet grippingly readable, Nimrod T. Frazer’s Send the Alabamians will delight those interested in WWI, the World Wars, Alabama history, or southern military history in general. Historians of the war, regimental historians, military history aficionados, and those interested in previously unexplored facets of Alabama history will prize this unique volume as well. Nimrod T. Frazer is the son of Will Frazer a Greenville native and World War I veteran (Rainbow Division, 167th Infantry Regiment, D Company) who received a Purple Heart for wounds received at the Battle of Croix Rouge Farm. Rod Frazer is a Silver Star veteran of the Korean War, a graduate of the Harvard Business School, a successful business man and a member of the Alabama Business Hall of Fame. He has honored his father and the regiment by erecting a Memorial to the Rainbow Division and the 167th on the site of the battle of Croix Rouge Farm. It honors all the soldiers of the Rainbow Division who gave their lives on French battlefields during WWI.